If you want to know what Sydney Harbour looked like when Captain Cook sailed in, just look around you here. Our guide, Paul, has just hit the nail on the head. We’re on a boat slowly moving through a deserted Coal and Candle Creek, on both sides the gum trees grow down to the water. It’s still and serene, just the sounds of water lapping and birds crying. The only modern sights and sounds are ourselves and our clicking cameras. My aunt is visiting from the UK and she’s a passionate bird watcher. 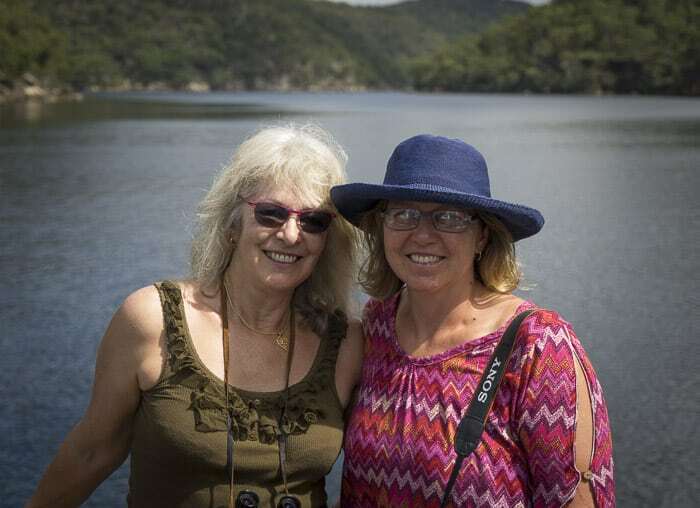 So our expedition into Ku-ring-gai Chase National Park is ideal. 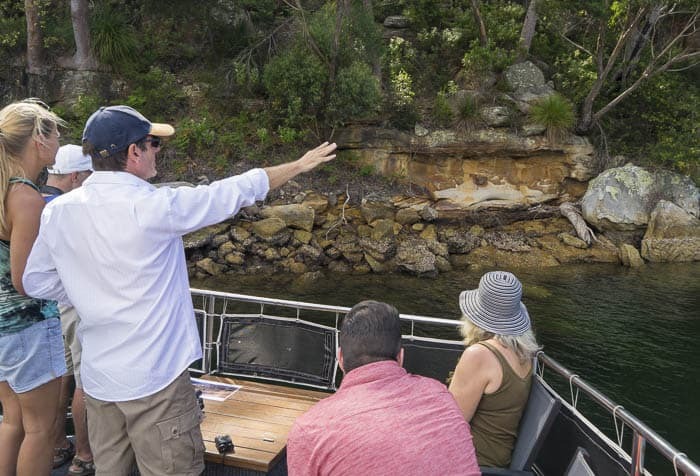 We’re on the Sydney OutBack Wilderness + Aboriginal Explorer Tour + Cruise, and we start with our cruise. 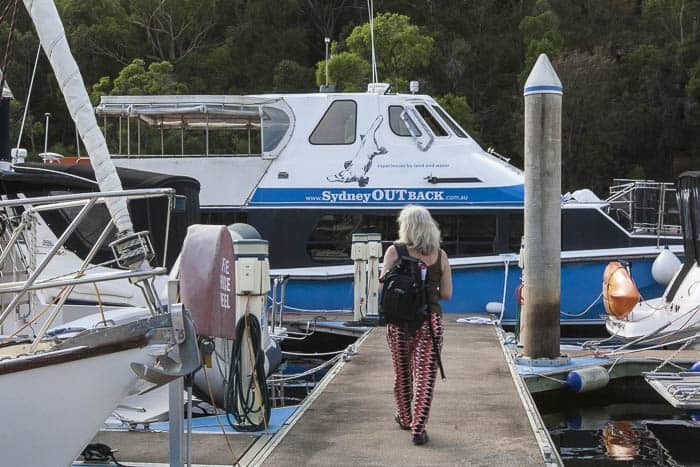 Sydney OutBack can pick up guests in the city or on the journey north to Ku-ring-gai. We were collected in Terrey Hills and taken by minibus to Akuna Bay to meet the boat. 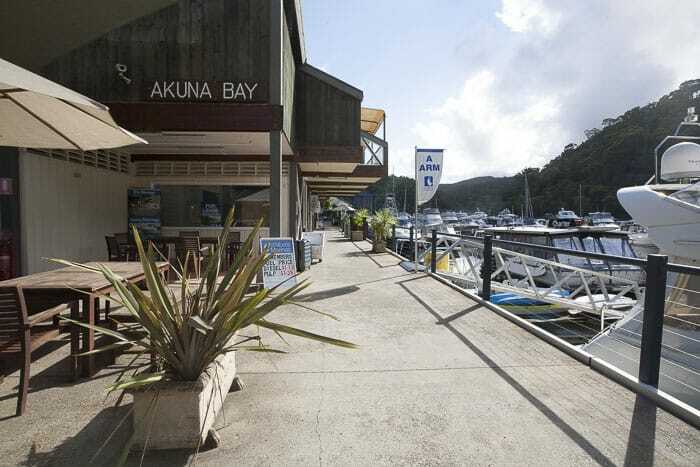 Akuna Bay is a terrific spot within the park and worth a visit on its own. 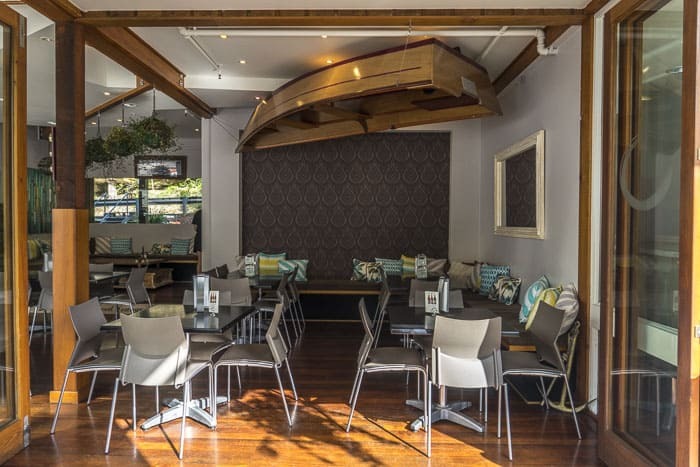 There are plenty of boats to see and a great little cafe by the water too. At the end of Coal and Candle Creek we see Cottage Point, with so many lovely yachts at anchor. 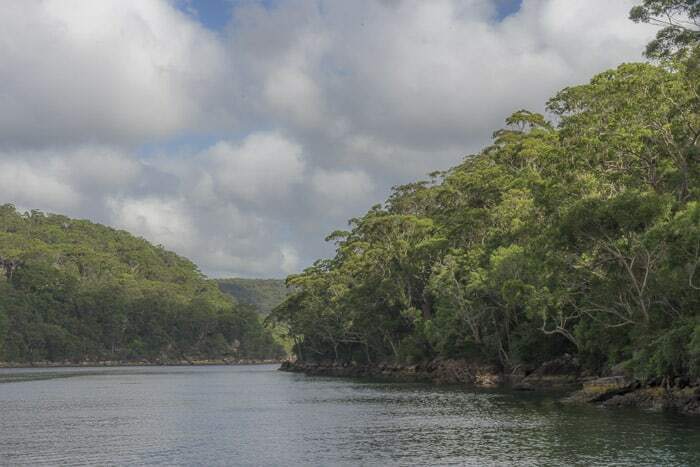 We then Turn to port and enter Cowan Waters, and then we go to port again and slowly move into the pristine waters of Smiths Creek. Our tour guide Paul is telling us about the history of the area and the indigenous people who lived here. 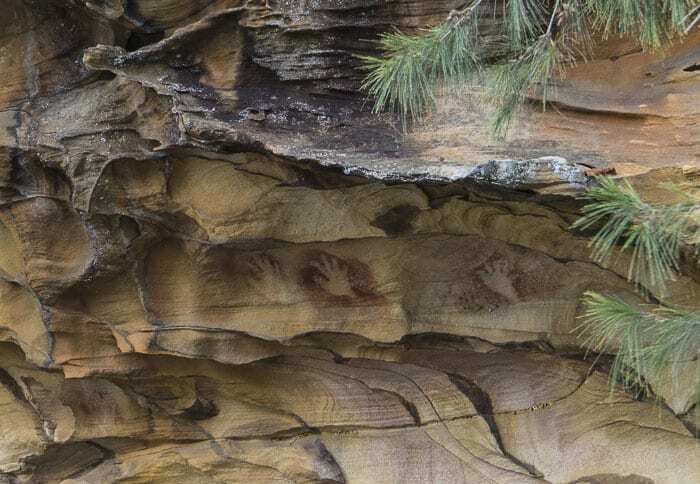 He can show us some rock art which would be completely inaccessible by land. There are charcoal paintings of bream, and red ochre paintings of snapper. And we see some hand paintings, Paul explains that these indicated a place where visitors can come to stay. Paul tells us about the grey gums and the red gums, about how they were used. He also points out a huge sea eagle nest up high in a tree… and I totally couldn’t get a good shot if it – shame, as I was amazed by how wide it was. 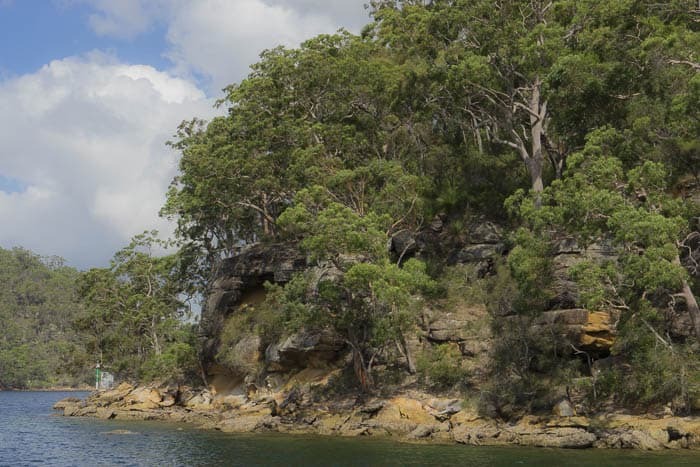 Did you know that Ku-ring-gai Chase is the third oldest national park in the world? It was gazetted after Yellowstone and the Royal National Park. Paul also explains his own family’s convict beginnings, and the history of the penal colony and of the indigenous people whom it almost entirely wiped out. He shows us weapons and a digging stick and an emu caller too, as we cruise back to Akuna Bay. From here we travel to West Head Lookout. 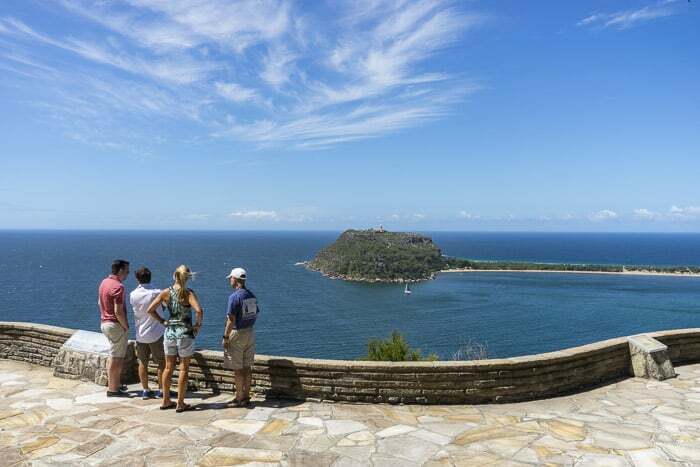 For more information on this stunning spot read my West Head post here. 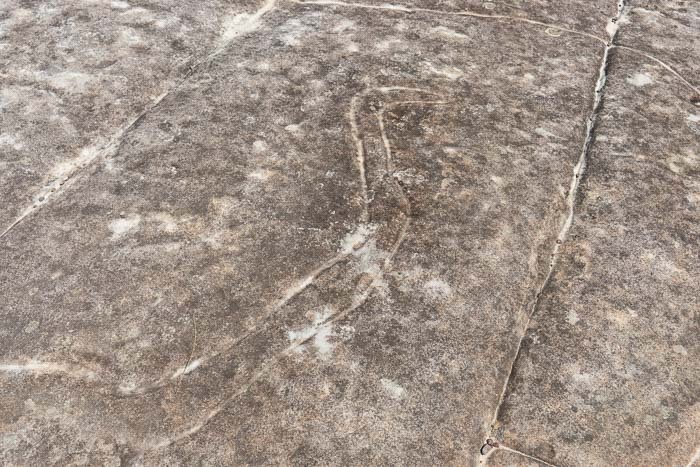 We now drive to an area where there are many, many rock engravings. First we need to walk along a wide track and then a much narrower one. We’d never find this alone. 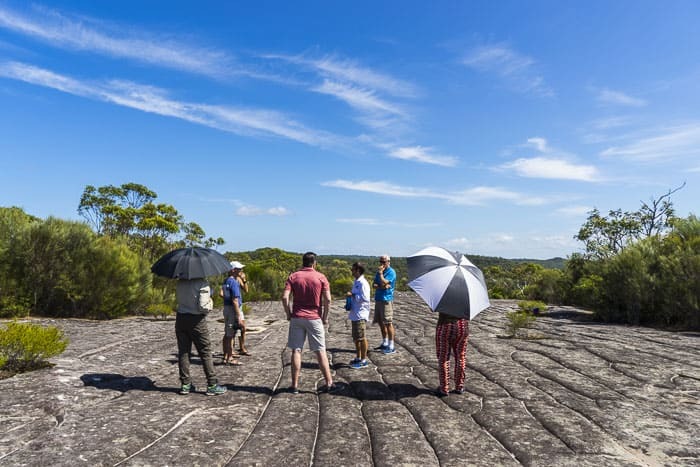 We’re at the a sacred engraving site that local elders have given Sydney OutBack permission to visit, it’s one of the largest in Australia. Some of the carvings are very obvious, others Paul outlines in water as he explains their significance. 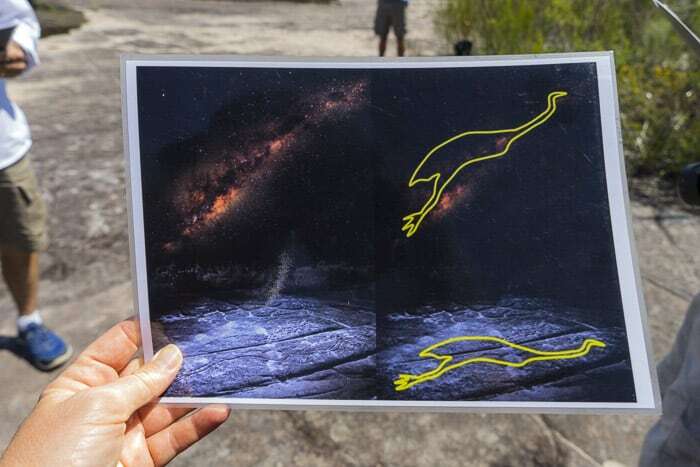 We see the large emu engraving, and Paul explains that it mirrors the ’emu in the sky’ contellation that can be seen at night in the stars above. This area holds many mysteries. We know some of the meanings of the art and some of the celebrations that took place here. But much is unknown too. It’s a magnificent and deeply peaceful place, and we linger to soak up the atmosphere. The day-long tour which Aunty Heather and I did costs $199 for adults and $149 concession. 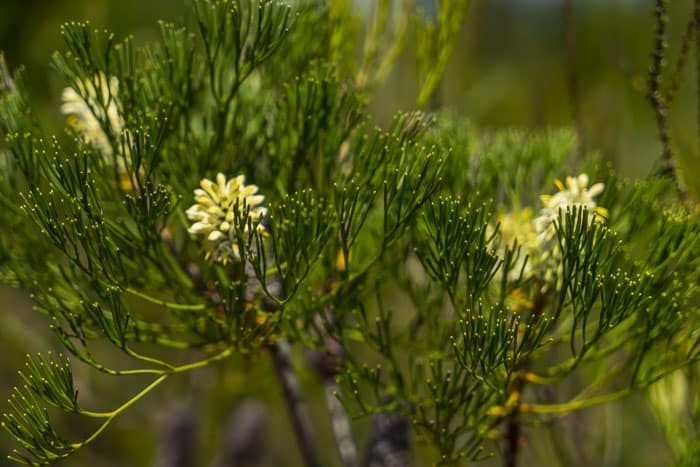 Having a guide does mean that you visit places you would never get to otherwise and you learn so much more about the area, it’s indigenous inhabitants and its flora and fauna. This would make a great family treat for both adults and children alike. 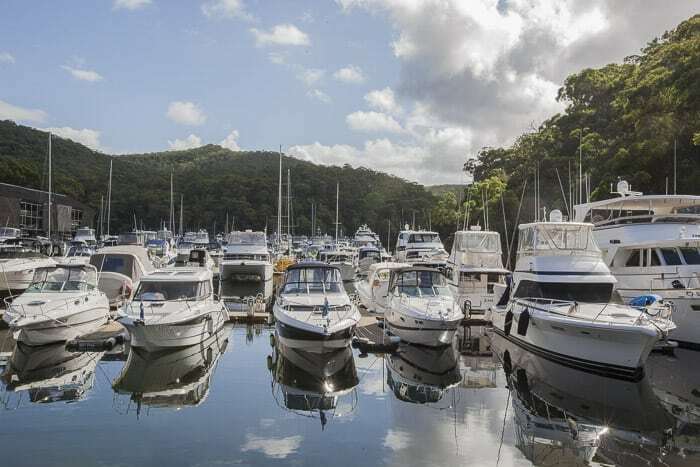 Read more about Ku-ring-gai Chase National Park here. Many thanks to Sydney OutBack for hosting us on this tour. Do you know this gorgeous area of Sydney? 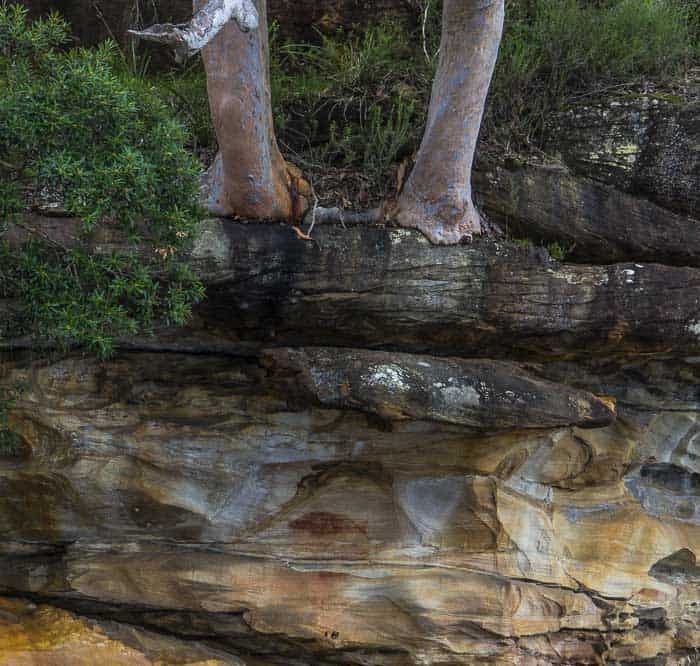 Have you seen indigenous rock paintings and engravings around Sydney? I never would have expected that a tour like this would be available so close to Sydney! 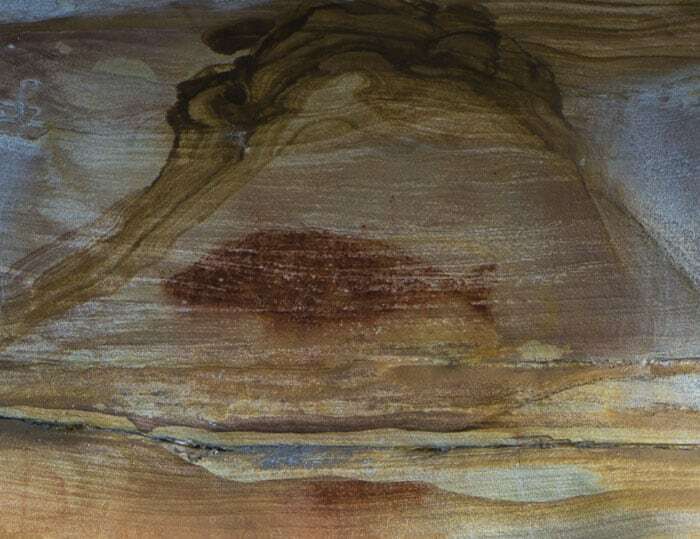 I have only seen aboriginal rock paintings in the Flinders Ranges. It was quite an eye-opener for us too. 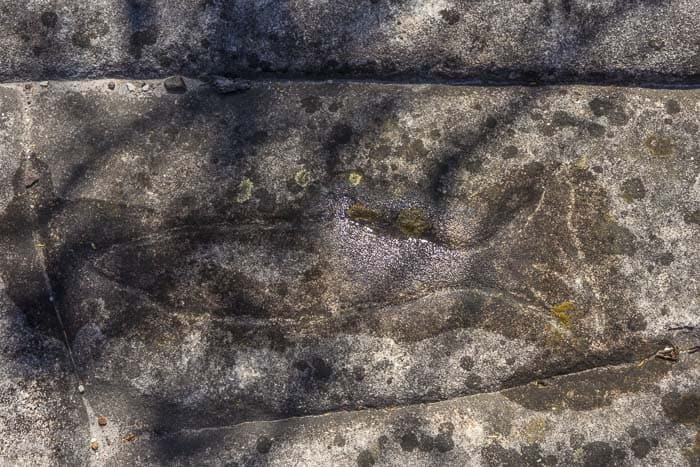 We have visited the lovely carvings on Berry Island, very easy to see them there. 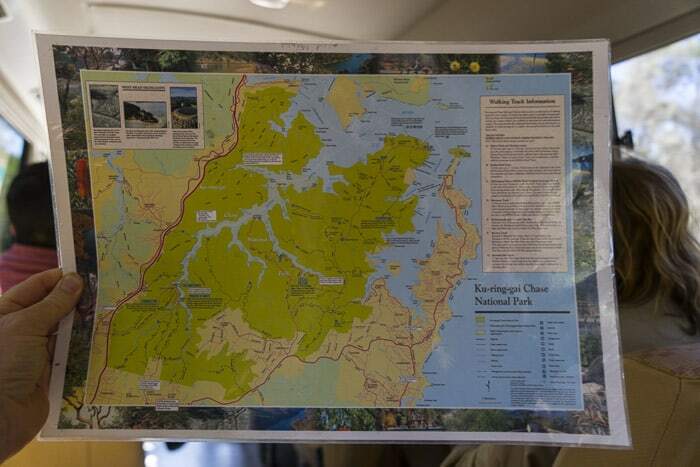 But the sites up in Ku-ring-gai are like the ones I have seen in Kakadu, really large. 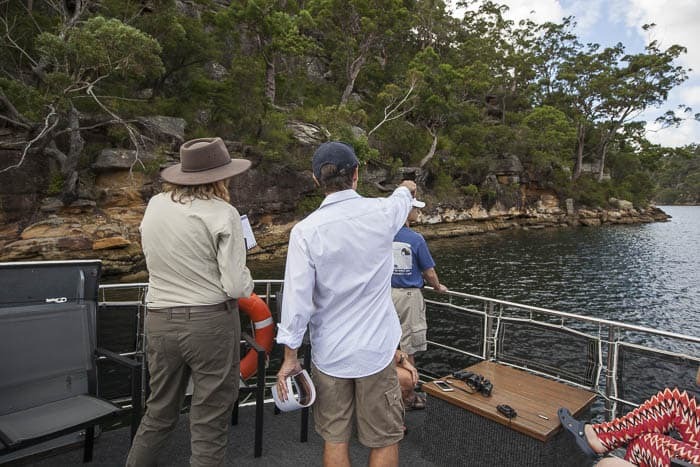 What a great way to experience historical, natural, cultural Sydney without leaving the city. I can feel the peace in the last photo.